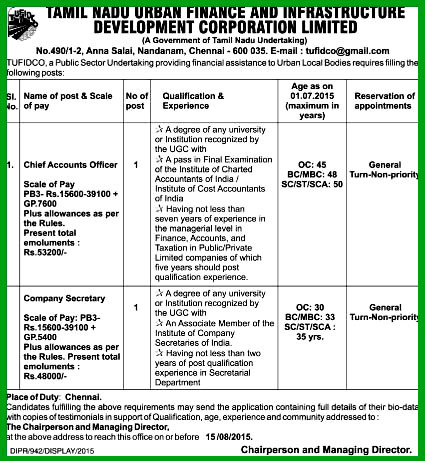 Applications are invited for the post of Chief Accounts Officer and Company Secretary vacancy in Tamil Nadu Urban Finance and Infrastructure Development Corporation Ltd (TUFIDCO) Chennai under direct recruitment process. Chief Accounts Officer - 1 Post (UR non priority) - Basic Pay 15600 Grade Pay 7600 in Pay Band III - any Bachelor's Degree with CA Final with 7 years experience, in which 5 years experience should be in after the CA Final qualification - Age 45 years for UR ; 48 years for BC / MBC ; 50 years for SC / ST / SCA. Company Secretary - 1 Post (UR non priority) - Basic Pay 15600 Grade Pay 5400 in Pay Band III - any Bachelor's Degree with Associate Member of Institute of Company Secretaries of India (ICSI) with 2 years experience - Age 30 years ; 33 years for BC / MBC ; 35 years for SC / ST / SCA.